It takes a lot for the Chief Rabbi to remonstrate with a big political cheese and denounce an official independent inquiry. But the elevation of Shami Chakrabarti to the Peerage so soon after absolving the Labour Party (and Jeremy Corbyn) of multiple charges of anti-Semitism stinks like a hefty slab of Stilton. As a lawyer, she really ought to be attuned to allegations of bias and the perception of bias. There were murmurs of suspicion when she announced her membership of the Labour Party on the same day she was asked to lead the review. She ditched her longstanding (and highly respected) political neutrality in order, she explained, to gain members’ “trust and confidence”, which is curiously sophistic. Why would the author of an independent inquiry into Labour’s anti-Semitism consider it more important to gain the trust and confidence of Labour Party members than remain untainted by the perception of partisanship or pre-ordained bias? Unless, of course, a peerage was mooted as long ago May, and Corbyn wasn’t talking about a comfy crossbench sinecure. Her report has been widely criticised for its evidential omissions and inadequacies: some called it a “whitewash” for suppressing an interview which Corbyn gave on his “friends” in Hamas. That suppression is compounded by another: that of Baroness Royall’s report into the anti-Semitism of Oxford University Labour Club. We read that the Baroness was “visibly frustrated” by the NEC-imposed restrictions on publication (leaked copy available HERE). By way of redress, “the peer had been offered a key role in the new inquiry into anti-Semitism in an apparent bid to allay her concerns that the report would not be released to the public”. Quite why such an obvious buy-off should allay the Baroness’s shame and dismay that her party has been infected with the “ancient virus of anti-Semitism” is unknown, unless, of course, it’s a matter of party loyalty before anti-Semitic truth. No wonder Chief Rabbi Ephraim Mirvis concludes: “Shami Chakrabarti has a proud record of public service, but in accepting this peerage, the credibility of her report lies in tatters and the Labour Party’s stated intention, to unequivocally tackle anti-Semitism, remains woefully unrealised.” It’s all the more puzzling that Shami Chakrabarti doesn’t appear quite to grasp the significance of this. Keith Vaz, Chairman of the Home Affairs Select Committee, is determined to get to the bottom of it all. “We were told that this was an independent inquiry,” he said, “and if it transpires that Shami Chakrabarti was offered her peerage before she was appointed or during the time she was appointed to conduct that inquiry then we needed to have been told.” So he has written to her, demanding answers. When the author of Labour’s official inquiry into anti-Semitism herself becomes the subject of an official inquiry, Jews everywhere are right to question the reliability of her methodology and the validity of her findings. And all reasonable, intelligent and discerning people of all faiths and none might make a justifiable observation of potential corruption, which might be called ‘Whitewash for Peerages’. You can’t investigate anti-Semitism with cover-ups and buy-offs. Indeed, it smacks of institutional conspiracy to pervert the course of justice and avert the pursuit of truth. But perhaps it’s a truth they can’t or don’t want to face. 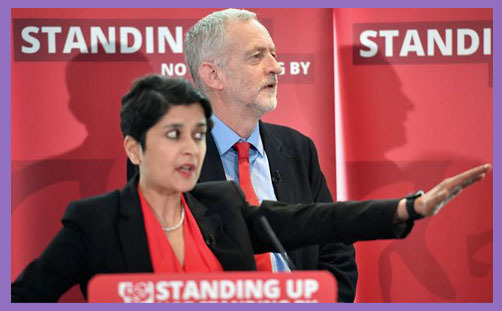 Perhaps Baroness Chakrabarti and Baroness Royall can unite now in the House of Lords to lead a transparent, open and very public inquiry into Labour’s anti-Semitism since Jeremy Corbyn became leader. By focusing specifically on anti-Semitism (rather than including ‘other forms of racism’), and by limiting the historic scope of the inquiry to the past year (ie since 12th September 2015, when Corbyn became leader), we might derive a more honest assessment of the swift spread of the infection, and so prescribe a more effectual antidote – however inconvenient that truth may be to Jeremy Corbyn’s leadership.